Using Nero Burning ROM, the CD burner software to burn NRG, ISO and CUE image file. When you download software from internet, usually they come in the form of image ( NGR, ISO or CUE). Take Linux Fedora Core as an example, the installation image for CD and DVD came in form of ISO image. To make this Linux Fedora Core CD or DVD bootable for the installation proposes we need tool/software to burn this image to the CD-Rom or DVD-Rom. 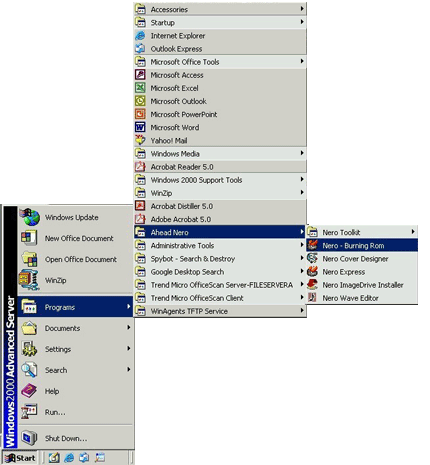 One of the software available to fulfill this purpose is Ahead Nero Burning ROM. Usually the Ahead Nero Burning Rom software come in bundle with your CD writer or you can purchase the burner software from their website. 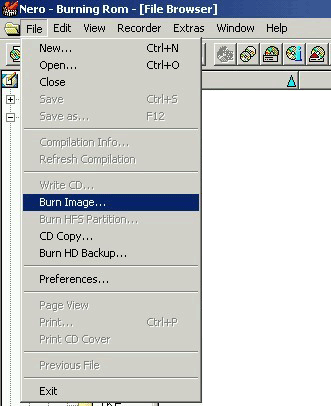 The article below show the step by step process on how to burn ISO image, NGR image or CUE image file to CD-ROM using the Ahead Nero Burning Rom software. Step-by-step how to burn ISO image file to cd using Nero Burning Rom software. The example below show the process of burning Fedora Core ISO image to CD-ROM disk. 1. To open the Nero burning ROM software, click Start, point to Programs, point to Ahead Nero, and then click Nero - Burning ROM. 3. On the Open dialog box, locate the ISO image on your disk. If you cannot see the ISO image, make sure that to point the File of type to Image Files (*.nrg, *.iso, *.cue). Click to highlight the ISO image that you want to burn to CD, then click Open button. 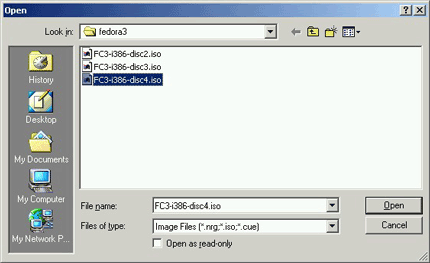 In this example we use the FC3-i386-disc4.iso, Linux Fedora Core 3 disc 4 installation image. 4. 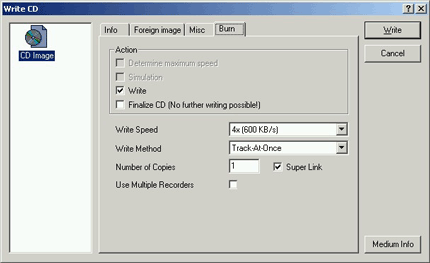 Insert blank CD-RW disk or CD-R disk on to your CD-ROM writer (CDRW), then click Write button to start burn the ISO image to the CD. 5. 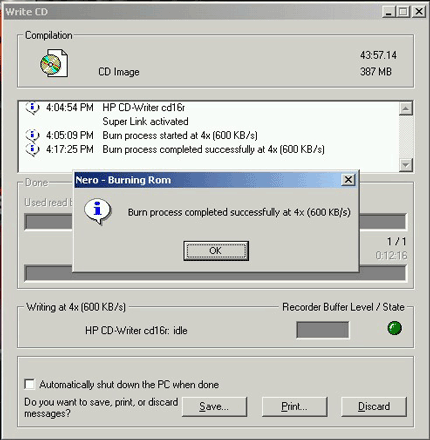 The Write CD dialog box prompt the progress bar and display the progress of the burning process. NOTE: The example above only show the step-by-step how to burn ISO image file to CD for Linux Fedora Core 3 disc 4 ISO image using the Nero Burning Rom software, the step-by-step procedure above also can be use to burn NRG and CUE images. Keywords: burn iso image, burn NGR image, burn CUE image, burn iso to disk, burn image, burn image file, burn image using nero, nero burning rom, how to burn ISO, how to burn NGR, how to burn CUE, image file using Ahead Nero Burning Rom.